The foundation of India is based on agriculture. Cultivation not only feeds the millions living in the country but also earns foreign exchange via export. To ensure that the farmers make a good profit, maintaining a high level of soil fertility is required. 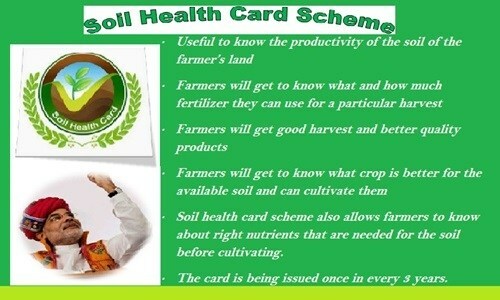 The government has thus implemented the Soil Health Card Scheme. The program will provide the farmers with the chance of knowing about the fertility level of the soil on their land holdings. Under the Soil Health Card Scheme, each farmer will be given the opportunity of getting important information about the fertility of the soil of their land. This will be done by collecting soil samples and tests will be conducted in government or private laboratories. With the assistance of the Soil Health Card, the government will provide the farmers with an official report that will assist in the evaluation of the fertility, nutrient composition, moisture level and other related aspects of the soil. With the assistance of the results, the farmers will be able to take necessary steps to improve the soil fertility. As per the guidelines of the scheme, each farmer will get the chance of getting the soil sample testes over a period of three years. After every three years, the soil from the farm will be tested again. It has been estimated that during the implementation of the scheme, over 14 crore farmers will be benefitted, on a yearly basis. This target will be reached over a span of three consecutive years. 253 lakh samples will be evaluated in the labs every. Till 2015 end, the around 34 lakh soil fertility passes have already been given to the farmers. The scheme will be implemented in all parts of the country. It has been sponsored by the central government and the center will provide the state government with an amount of Rs 190 for carrying out each soil sample test. A total of 568.54 crore will be spent on over a span of 3 years. The Soil Health Card will contain report and details about the nutrient level of the soil. The fertility level of the soil will be tested on the basis of 12 separate parameters. These will contain test of macro nutrients, secondary nutrients, micro nutrients and physical factors of the soil. The experts will gather sample of dirt from all four corners and also the middle of the farm. The sample will be extracted from a death of 15 to 20 cms. The five samples will be mixed properly and the required amount will be stored and marked as the sample. It will be sent to the respective soil testing labs. As per the guidelines of the scheme, the task of collecting the samples from the individual farms will be done by the experts of people working in the Department of Agriculture or any private agency. Apart from providing a complete detail of the fertility level of the soil, it will also provide the farmers with the important steps, which will assist them in increasing the fertility of the farm land. It will also provide information on the kinds of fertilizers that must be utilized and also the specific amounts. The people who are in charge of gathering the soil samples will be taking the assistance of GPS tools for locating the area. Each sample will be extracted from a grid area of 2.5 ha in the areas that depend on artificial irrigation facilities. The grid area will measure 10 ha in those areas that get adequate rain water. As of now, the central government has been concentrating on testing the soil samples, mostly taken from the states of Punjab, Andhra Pradesh, Chhattisgarh, Telengana and Odisa. But the government plans on starting the same in the rest of the union territories and states as well. The scheme was developed under the careful watch of the Department of Agriculture, Cooperation & Farmers Welfare and all tests will be done under the Integrated Nutrient Management (INM) Division. For better awareness, the government has set up an official website for the scheme. One can get the details of the scheme and the application procedure from the official portal. The link of the portal is http://soilhealth.dac.gov.in/. Apart from the portal, the farmers can also track the status of the soil testing procedure via the application from their mobile phones. This application was launched in the year 2016. The link of to get the application is given on the official site as well. The guidelines of downloading and installing the SHC app can be acquired from the link http://soilhealth.dac.gov.in/Content/UserManual/UserManualMobAppSHC.pdf. If any farmer is interested in getting the soil of his/her farm tested, then they will have to register under the scheme. There is no extra charge that the farmers will have to pay as it is a central government sponsored welfare program. The registration forms are available both online and offline. Offline, the farmer will have to visit the office of the ‘Krishi Adhikari’ and acquire the form. For online procedure, the farmer will have to click on the link of the official portal (mentioned above) and get the application form. How to apply for the card? The offline procedure to acquire the benefits of soil sample testing is rather simple. The candidate will have to visit the office of the Krishi Adhikari and get the registration form. The form must then be filled with the particulars of the farmer like the name, residential address, Aadhar code, land details, contact number etc. Apart from the identification details, the farmers must provide information about the kind and number of crops that they raise on the farm. All these details will be studied during the testing and proper solution will be provided. Photo copies of all these documents must also be attached with the application form to support the claims made by the farmers. The form must then be submitted to the respective office of the Krishi Vibhag and the rest of the verifications will be done by the employees there. Once the verifications have been done, the experts will get in touch with the farmer while collecting the soil sample. The test results will be provided to the farmer in the form of a card. The data must be filled in the card on a yearly basis to measure the improvement or decline in the soil fertility. For this, the interested candidate will have to click on the link of the official site of the scheme. The link is http://soilhealth.dac.gov.in/. After the home page appears, the farmer will have to create an account by clicking on the right link. Once the form appears, all identification details and land details must be typed in. It will assist the authority in verification. Once the soil testing has been complete, one can track the status of the card from the online site. For this, they will have to log on with the ID and password, that will be generated by the site. The card will not only assist the farmers in getting overall productivity report of the land but will also be able to enhance the future crop production by following the remedial measures that have been suggested by the agricultural experts. To encourage the production of durable farming the government of India started Mrida(Soil) Management programme. The main aim of the programme is to optimally utilize natural resources through essential nutrients management and hence increase the fertility of the land. Soil health management is a central regional scheme. For distribution of fine essence – 50% of cost maximum Rs 500 per hectare or Rs 1000 per beneficiary.